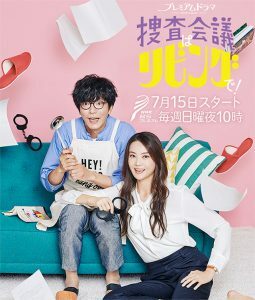 Synopsis: The 98th Drama Serial is about Suzume (Nagano Mei), a lively girl born to a family running a small restaurant in Gifu Prefecture in 1971, who later loses her hearing in one ear from a disease. Being encouraged by her loving parents and childhood friend, born at the same hospital on the same day, she lives through an eventful life with never-give-up spirit. Synopsis: U.S. Consul General Townsend Harris is received in audience by Iesada Tokugawa. Without any countermeasures, however, the Tokugawa Shogunate is thrown into chaos. Meanwhile, Kichinosuke and Sanai Hashimoto work on putting Yoshinobu Hitotsubashi forward as a shogun but Yoshinobu himself resists it firmly. And Naosuke Ii sends an assassin to Yoshinobu. Synopsis: Japanese manga artist Akatsuka Fujio (Tamayama Tetsuji) is known for his outrageous comics, but his real life was more than that! 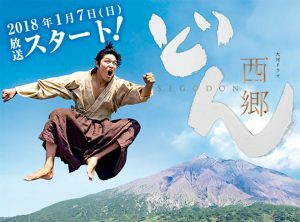 Commemorating the 10th anniversary of his death, this drama portrays his reckless life and his family based on an essay written by his daughter Rieko (Sumida Mieno). Kashimura Tetsuo (Nakamura Toru) has worked at the investment department of a major bank in Tokyo for many years. Life is smooth sailing until a merger with another bank affiliated with a conglomerate is announced. After taking a good look at his life, Kashimura decides to change jobs. 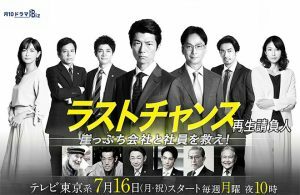 He is recruited by Yamamoto Tomoya (Otani Ryohei), the CEO of an investment fund, who appoints him to be the CFO of Delicious Food, a restaurant franchise company, and turn around the business. 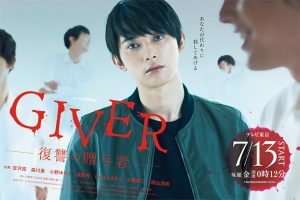 Giba (Yoshizawa Ryo) and several of his colleagues work at a revenge agency. A mysterious girl called “Taker” (Morikawa Aoi) leads the group. Giba lacks emotion for a person. The revenge agency takes on revenge requests on behalf of their clients. Their clients include a woman who is a victim of a fraud marriage and the family of a victim killed by a serial murderer. Sousa Kaigi wa Living de! 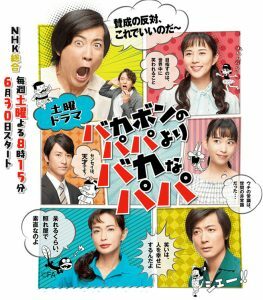 Synopsis: Morikawa Shoko (Mizuki Arisa) is a detective with the Criminal Investigations Department’s Special Unit. She has a strong sense of justice and became a police officer to make the best of her tremendous energy. Once there is a case, she will rush headlong against bad people. But at home, she finds housework bothersome and is hopeless at it. Shoko’s husband Akira (Tanabe Seiichi) is a mystery writer. He is exceptionally smart, genial and sensitive. Born to a sporty family which ironically has served the police generation after generation, Akira went against the wishes of his parents to be a writer. However, his novels are too tedious and quite unpopular while his blog on household matters which he writes without any particular reason is a big hit. So he finds himself in the extremely complicated situation of a “charismatic house husband”. This odd couple solve various cases and mysteries with brain and brawn. Add their son Nao to the mix and information and deductions constantly fly about their living room.